On Thursday, November 1, Chesapeake Conservancy celebrated the 2018 Champions of the Chesapeake at an awards ceremony honoring The Department of Defense’s Readiness and Environmental Protection Integration (REPI) program, The Conservation Fund (TCF), and Ecosystem Investment Partners (EIP). Nearly two hundred people celebrated the honorees at the Carnegie Institution for Science in Washington, DC, where Jeff Corwin, Emmy-winning television host, author, and biologist, served as keynote speaker. Corwin is also the host of “Expedition Chesapeake,” a giant-screen film that journeys into the mysterious and beautiful watershed and explores the connections between the millions of people, plants, and animals that call it home. An honor song in gratitude to the awardees was performed by members of the Upper Mattaponi and Chickahominy tribes. The event featured sculpture art by award-winning Chesapeake Bay driftwood artist Larry Ringgold. 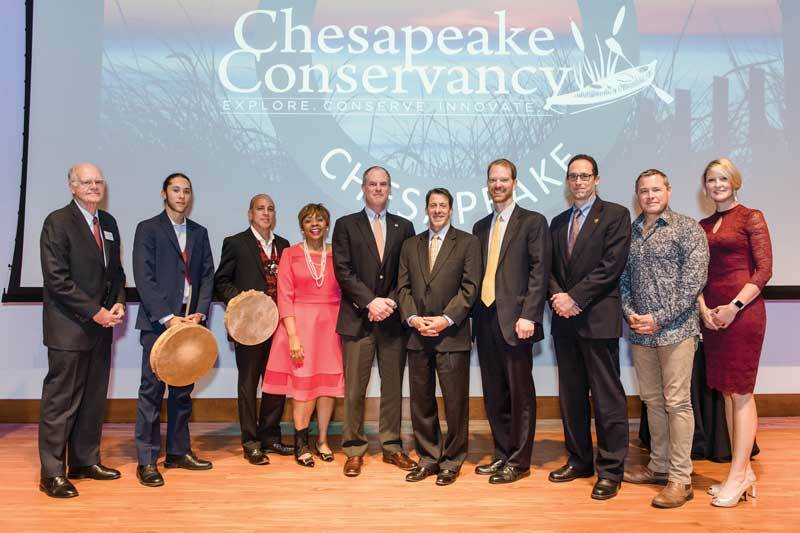 A valuable partner to Chesapeake Conservancy’s conservation work, REPI was honored for its creative approach to conserve habitat and biodiversity across a 385,000-acre corridor in the Chesapeake. Together with REPI and partners, Chesapeake Conservancy has completed nine projects conserving more than 1500 acres on DelMarVa near the beautiful Nanticoke River. TCF was selected as a Champion of the Chesapeake for its signature commitment to conserve naturally and culturally important land across the Chesapeake and along the Captain John Smith Chesapeake National Historic Trail, such as Werowocomoco and Fones Cliffs in Virginia. “The natural and cultural treasures of the Chesapeake Bay draw you in and inspire countless individuals to explore the rich history of the region,” said TCF’s president and CEO Larry Selzer. EIP was honored as a leader in the private sector environmental mitigation and restoration industry. Now the largest equity restoration company in the United States with headquarters in Baltimore, EIP has developed an impressive track record delivering stream restoration through pay for success delivery contracts. “Through cutting edge pay-for-success contracts with the Maryland Department of Natural Resources and Maryland State Highway Administration, these restoration projects will deliver more than 16,000 pounds of nitrogen, 3000 pounds of phosphorus, and 2600 tons of sediment per year, at a cost savings to the taxpayers of Maryland. We want to be making more such investments all over the Chesapeake Bay watershed. Thanks to the Chesapeake Conservancy’s high resolution data, we are able to truly prioritize and focus our efforts where we can achieve the best return on our conservation dollars,” said EIP managing partner Nick Dilks. 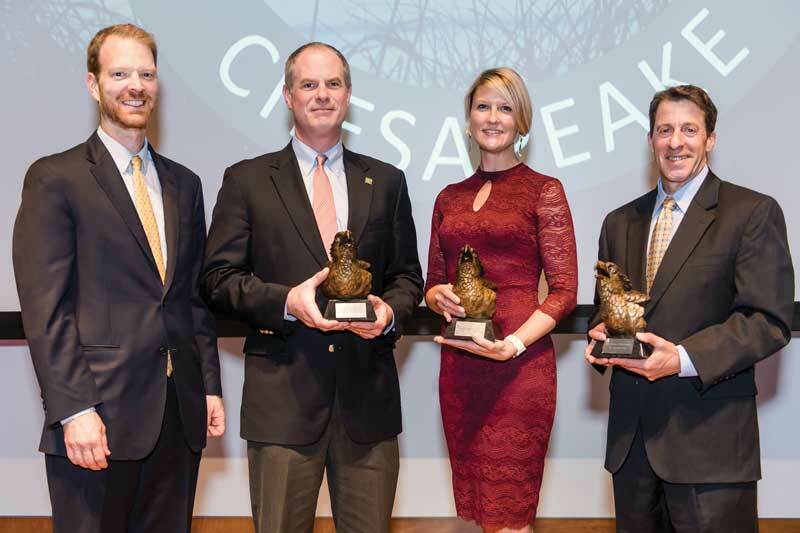 Chesapeake Conservancy thanked its honorees, guests, and sponsors for making the evening possible.